Note: This show is on Friday rather than the usual Thursday. All Uptown Concerts shows at Baldwin’s Station in 2019 start at 7:30pm unless otherwise noted. Despite his relatively young age, MPress recording artist Seth Glier is a seasoned troubadour. A singer-songwriter, producer and multi-instrumentalist who averages over 250 live performances annually, Seth has gone from opening act to headlining his own shows and playing major festivals. He’s shared the stage with artists as diverse as James Taylor, Ani DiFranco, Edwin McCain, Martin Sexton, Emmylou Harris and Ryan Adams, and has quickly become known for his passionate live sets and powerful command of both piano and guitar. His music has also caught the ears of fans, industry and critics alike, with USA Today stating that his “exquisite tenor echoes Bruce Springsteen and Billy Joel.” Building on the acclaim of his Grammy®-nominated sophomore album The Next Right Thing, Glier’s subsequent record Things I Should Let You Know landed him his first Daytrotter session, was called “a genuine revelation” by Blurt Magazine, and was praised by M Music & Musicians Magazine for its “shimmering, seductive melodies”. On his fourth album for MPress Records, If I Could Change One Thing (April 2015), Glier embraces a genuine modern-pop direction, marking a bold departure from his previous, more acoustic recordings and the beginning of an exciting relationship with Los Angeles-based producer/songwriter Bill Lefler (Ingrid Michaelson, Joshua Radin, Dashboard Confessional). “Bill’s energy, drive, and experience gave me a safe place to get creative and tap into a deeper part of my inner voice that has yet to be heard on any of my previous albums.” The album includes a gorgeous duet with American Idol’s Crystal Bowersox, as well as musical appearances by Pat Matera (Katy Perry) and Daniel Rhine (Sara Bareilles). Featuring collaborations with renowned songwriter Trent Dabbs (“Girls Chase Boys” / Ingrid Michaelson), hitmaker Steve Seskin (Tim McGraw, Peter Paul and Mary, Peter Frampton), and Alex Wong (Delta Rae, Vienna Teng), If I Could Change One Thing merges genres seamlessly, with universal songs about falling in and out of love and social action that capture a songwriter and performer at the peak of his young abilities. My name is Seth Glier. I am a twenty four year old singer-songwriter who makes a living traveling around the country in my Toyota Prius performing 250 shows a year. From Boston to San Fransico, Austin to Ann Arbor my Prius is the trusted invisible band member, who, for the last 4 years, has allowed me to play for you & be the first zero Carbon Footprint Touring musician. On Sunday, Feb 24th, My Prius was totaled as I got T-boned by an oncoming truck in upstate NY. Upon the collision, my keyboard flew up in the air, my windows blew out, my front axel snapped in half, and I was sent spinning across the highway into the snow bank. Simply put, airbags & a seatbelt saved my life. via Oh Prius, After All These Miles & Memories | Indiegogo. 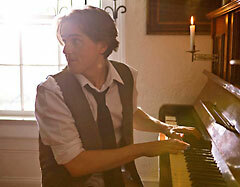 Seth Glier will perform at Cellar Stage on April 5th, 2013. 2012 Grammy nominee Seth Glier will be at Cellar Stage on Harford Road on Friday, April 5. Tickets.